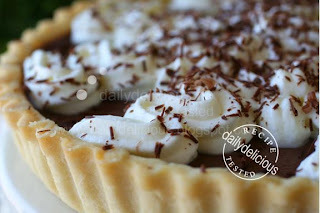 Chicken Farm Bakers' Project #11 Welcome To Rain With Tart & Pie: Chocolate Custard Tart, and the theme for this month is very suitable for me. I start getting a cold from the first of June and still, well the weather here is very bad, rainy and hot, haha, I just don't have the right word to describe it >*<. So, the best thing for me (and for this month) is everything that I like to eat ^_^, such as chocolate and whipped cream, haha. 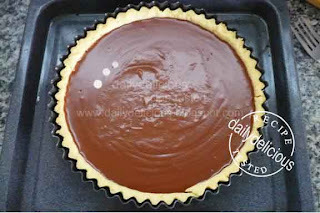 I choose to make the chocolate custard tart, the mixture of soft chocolate filling that is going very well with the lightly sweeten whipped cream, another comfort food for me. 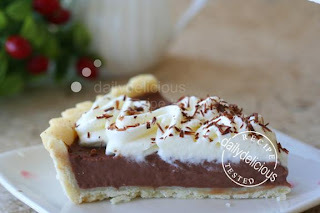 I found this tart is very comforting, and delicious, haha, it reminds me of the first love (a cold chocolate drink and whipped cream, ^ ^), and I just can't stop longing for chocolate. But this tart is not a dark side of my love, it's the children side, the mild flavor of the chocolate custard filling, that really make you eat it more. 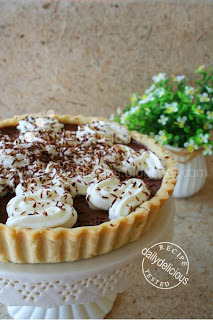 So, if you feel the same as me, (I really don't want to go outside), take your time to make this tart and you might fell in love with this chocolate tart too. Beat the butter until soft, add the sugar, then beat until combine. Pour the egg and vanilla essence into the butter mixture, beat only 1 minute, the mixture will be curdle. 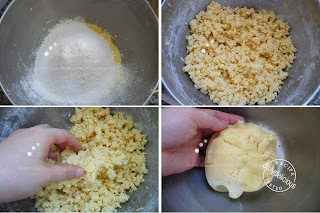 Put the flour into the butter mixture, beat just until the mixture looks like bread crumb. Using your hand to push the mixture into a ball. Take the dough out of the bowl and knead for 3-5 time just until the surface of the dough seen smooth. Cover with plastic warp, and refrigerate for 30 minutes. Lightly butter the tart pan. On the floured surface, roll the dough into a 4-5 mm sheet. Using the rolling pin to move the dough over the tart pan. 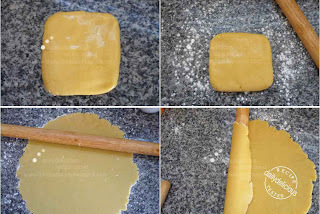 Cut the dough and push the dough to fit the tart pan trim off the dough, then using a fork to prick the tart shell. Put the tart shell in the oven and bake for 15-18 minutes or until lightly brown. Sift the cocoa powder, corn starch, sugar and salt together, set aside. 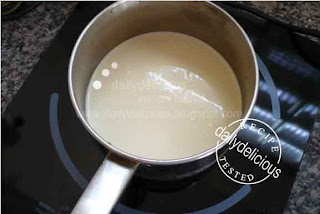 Put the cream and milk into the medium pot and bring to simmering (not boil). Meanwhile, beat the egg until light (the egg yolk and white are homogeneous). 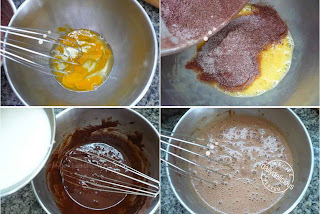 Pour the sifted ingredient into the bowl, mix to combine, then pour the milk and cream mixture into the egg mixture gradually (whisk all the time). Pour the mixture through a strainer into a medium pot. Bring to simmering over low heat, until the mixture thicken. 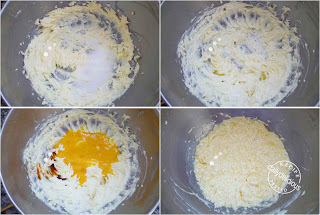 When the mixture is thicken, take the pot from the heat and put the butter into the custard and whisk slowly until the butter is melted. Pour the custard into the tart shell. 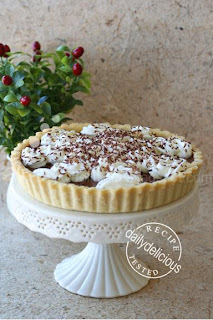 Refrigerate the tart for 4 hour or overnight. 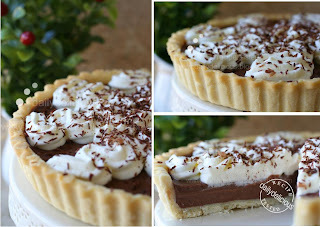 Pipe the whipped cream over the tart, and sprinkle with the grated dark chocolate. Love all your creations and recipes..hope to try out soon. May god bless you and for your kindness in sharing your recipes. I think this is a great website and you are generous in sharing your 'japanese' recipe..:)I think I am going to try out some of these recipes soon. I came across your website by accident and I am enjoying every minute of it! Love it! Keep it up. is it possible to add fruits on top of the chocolate tart? Yes you can use fruits, it will be great too ^^. Hello! I just bought a tart mould & can't wait to try this recipe out. Wondering this recipe calls for how big a tart pan? btw, nice blog you've! alot of beautiful creations!